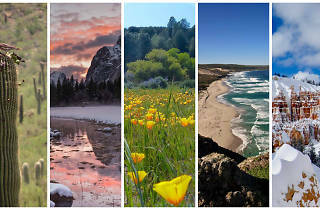 Check out these 14 incredible National Parks within driving distance of L.A.
Worldwide icon-chevron-right North America icon-chevron-right United States icon-chevron-right California icon-chevron-right Los Angeles icon-chevron-right Check out these 14 incredible National Parks within driving distance of L.A. There's never been a better time to show your support for this country's incredible National Park system. 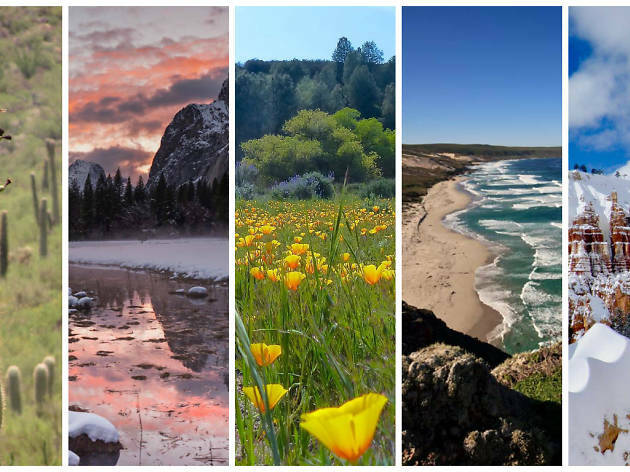 We're lucky to live in a nation that protects and preserves 59 separate parks (nine of which are in California, the most in any state) totaling 51.9 million acres of land. We highly suggest making the trip to as many of these parks as possible, but have chosen to highlight those within a day's drive (eight hours or less) from Los Angeles—some are perfect for a day trip; others are better reserved for a road trip or weekend of camping. So get out there and enjoy (before it's too late!). 2 hours 30 minutes from L.A.
2 hour drive, plus a 1-4 hour boat ride, from L.A.
Five of the eight Channel Islands are protected, and half of the park's area is underwater. The Islands are home to more than 2,000 species of land plants and animals, and 145 are unique to the Islands, including the Island Fox. 3 hours 45 minutes from L.A. This park protects the Giant Forest, which boasts some of the world's largest trees, General Sherman being the largest in the park. It also has more than 240 caves, a scenic segment of the Sierra Nevada (including the tallest mountain in the contiguous United States), and Moro Rock. 4 hours 15 minutes from L.A. This park is home to several giant sequoia groves and the General Grant Tree (the world's second largest). It also features part of the Kings River, which flows through Kings Canyon, and the San Joaquin River, as well as Boyden Cave. 4 hours 30 minutes from L.A.
Death Valley is the hottest, lowest and driest place in the United States, with temperatures topping an insane 130 degrees. It's home to Badwater Basin, the lowest elevation in North America. That being said, the park is home to a diversity of colorful canyons, desolate badlands, shifting sand dunes and sprawling mountains, as well as more than 1,000 species of plants, plus salt flats, historic mines and hot and cold spring oases. Pinnacles is famous for its massive black and gold monoliths of andesite and rhyolite, which are popular with rock climbers, and it's many quiet trails crossing scenic Coast Range wilderness. The park is home to the endangered California condor as well as a large population of prairie falcons, and more than 13 species of bats living in the park's caves. 4 hours 45 minutes from L.A.
Yosemite features towering granite cliffs, dramatic waterfalls and old-growth forests, as well as the rock faces Half Dome and El Capitan, the Yosemite Valley and Yosemite Falls, the country's tallest waterfall. Three giant sequoia groves, along with a pristine wilderness in the heart of the Sierra Nevada, are home to an abundance of rare plant and animal species. 6 hours 30 minutes from L.A.
Geologically diverse Zion boasts colorful sandstone canyons, mountainous mesas and countless rock towers. There are four distinct ecosystems here: desert, riparian, woodland and coniferous forest, plus natural arches and exposed plateau formations. 7 hours 15 minutes from L.A. The Grand Canyon is carved by the mighty Colorado River; millions of years of erosion and carving by the Colorado River have exposed 277 miles of colorful layers of the Colorado Plateau. The Canyon itself is a mile deep and at it's widest expanse, 15 miles wide. Grand Canyon National Park is the second-most visited park at 5.5 million visitors per year. 7 hours 30 minutes from L.A. This park, part of the dry Sonoran Desert, is home to a great variety of life. Beyond the namesake giant saguaro cacti, there are barrel cacti, chollas and prickly pears, as well as bats, spotted owls and javelinas (hoofed mammals that look a lot like mini boars). 7 hours 45 minutes from L.A.
Bryce Canyon is a giant geological amphitheater on the Paunsaugunt Plateau. The unique area has hundreds of tall sandstone hoodoos (tall, thin rock spires) formed by erosion. The region was originally settled by Native Americans and later by Mormon pioneers. Based around Nevada's second tallest mountain, Wheeler Peak, Great Basin National Park contains 5,000-year-old bristlecone pines, a rock glacier and the limestone Lehman Caves, and is home to animals like bats, pronghorns and trout. It also boasts some of the country's darkest night skies. This park has four types of volcanoes including Lassen Peak, the largest plug dome volcano in the world. Lassen Peak last erupted in 1915, but much of the rest of the park is continuously active: molten rock heats numerous hydrothermal features including fumaroles, boiling pools and bubbling mud pots. This "forest" is made up of a large concentration of 225-million-year-old petrified wood. The surrounding Painted Desert features eroded cliffs of red-hued volcanic rock, dinosaur fossils and more than 350 Native American sites. Forgotten is the closet, the Santa Monia Mountains National Recreaton Area!